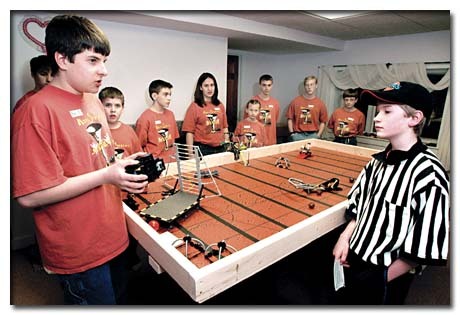 Ben Streeter, left, makes an adjustment to the team's robot while referee David Schunemann of Hollis, right, and the rest of the Mindstorms Mayhem team look on. The team will go to an international competition in April. But 10 young people from Hollis, Milford, Wilton, Merrimack, and Bedford have done just that. And as a result of winning the state FIRST LEGO League meet in December, they have been invited to the international robot competition. The 10 kids are a group of homeschooled students, and this is only their second year as a team, which they call Mindstorms Mayhem. This year’s competition involved building and programming a robot to solve nine missions based on the problems encountered by NASA in the Mars rover missions. The robots competed on two 4x8 foot tables with a mat that was a photo of Mars. At the state tournament Dec 13, Mindstorms Mayhem competed against 47 other teams and won the Director’s Award for best overall performance. This guaranteed the team an invitation to represent New Hampshire at the International Invitational at the Georgia Dome in Atlanta on April 15 to 17. But the fun stops here if Mindstorms Mayhem can't get to Atlanta. Teams must raise approximately $10,000 for transportation, lodging and food and is seeking financial support from businesses, community groups, and individuals. All donations are tax deductible and BAE Systems has offered to match any gifts up to $5,000. All donations should be sent to: Mindstorms Mayhem, 24 Grey Rock Road, Bedford, NH 03110. All checks should be made out to Mindstorms Mayhem / Milford School District. For more information, to make a donation, or to schedule a demonstration, go to www.mindstormsmayhem.org.